Turnover on the opening day fell slightly short of last year's record-breaking figures with the clearance rate nudging 90 percent and small declines in average and median. 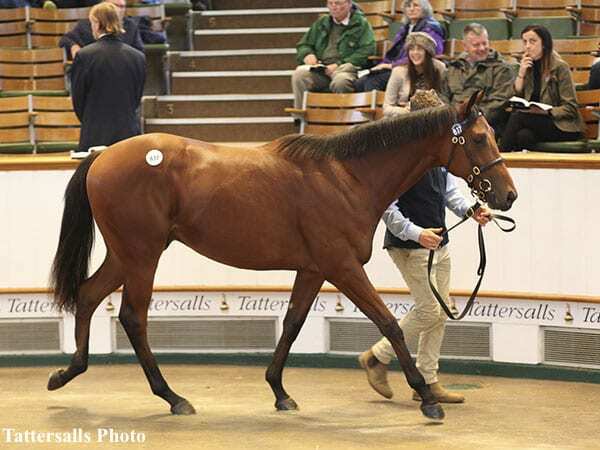 Fourteen lots sold for 200,000 guineas ($276,218) or more whilst 45 realized six figure sales. The colt, who hails from the family of champion 2- and 3-year-old Rodrigo De Triano, was consigned to the sale from Adrian and Philippa O'Brien's Hazelwood Bloodstock and is the second highest price ever achieved at Book 2 of the Tattersalls October Yearling Sale. “That was unbelievable,” said Adrian O'Brien, manager of the young operation based at Exning, just outside of Newmarket, adding: “It is the first year we are selling stock whom we have been involved with since conception so it is very pleasing. This entry was posted in Bloodstock and tagged Adrian and Philippa O'Brien, Hazelwood Bloodstock, john gosden, kingman, Reem, Tattersalls, tattersalls october yearling sale by Edited Press Release. Bookmark the permalink.